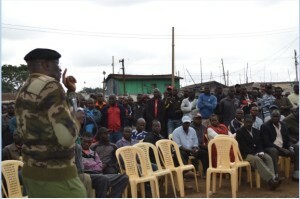 The first public security meeting was held at Kamkunji grounds, Kibera. The meeting was organized by the office of the Sarangombe ward representative and the office of the Deputy County commissioner. 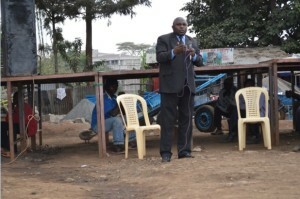 However, the Deputy County Commissioner did not attend as he was attending to other duties elsewhere. Hence, in attendance were the Member of County Assembly for Sarangombe, Sarangombe area chief, the ward Police inspector and the local leaders. 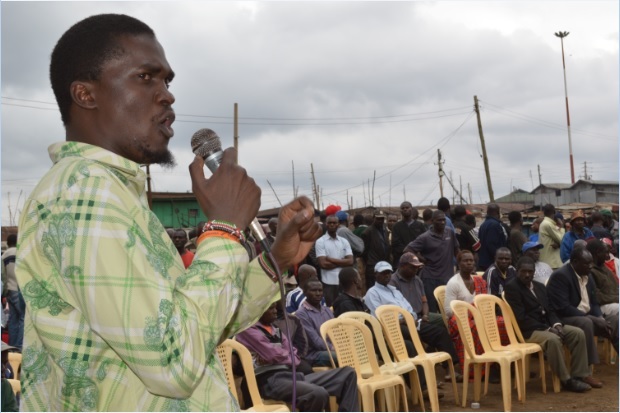 The area member of County Assembly, Mr. Owino Kotieno, narrated how Sarangombe and Kibera in general has been afflicted with insecurity issues which he compared to a recurring skin infection that refuses to go away. He also said, Contrary to what most people think, that insecurity is not always brought about by lack of employment, and even cited a few examples of people who are Jobless but are good members of the community. He also stated that respect for human rights is like an hacksaw that cuts from both sides, so the respect for human rights apply in both situation as far as dealing with human rights is concerned. The Inspector, in his part,told the residents that security starts with them, he also addressed the issue of girls dropping out of school. He condemned the criminal activities in the area and warned youths engaging in crime that their time is up and the police is soon catching up with them. He also warned the public against taking law into their own hands and walking around with machetes. The Sarangombe area Chief apologized on behalf of the Deputy County Commissioner who did not attend due to being caught up on duty elsewhere. The chief said that the area administration, together with the MCA’s office is looking to have the meetings happen often to always address emerging issues as far as insecurity is concerned. He went ahead to condemn playing loud music late into the night by saying that criminals use such places to plan their bad missions, and also school-going children don’t get time to study due the same loud music.